Owerri – Governor Rochas Okorocha of Imo State has advised the South East to shelve its 2023 presidential dream, saying the race for the nation’s number one seat would directly be between the North and the South West. He said the rejection of the presidential candidate of the All Progressives Congress (APC), Muhammadu Buhari, for the presidential candidate of the Peoples Democratic Party (PDP), Atiku Abubakar, by the South East had foreclosed the prospect of the zone to clinch the presidency in the next four years. The governor, who dropped the hint to newsmen while giving an update of political developments in the state, described the outcome of the last election in the zone (South East) as a huge minus to the Igbo nation. He lamented that the zone may no longer be represented at the APC’s national discussions. He, however, promised to rebuild and reposition the party in the state which did not produce a single member in the House of Assembly. The governor castigated the Independent National Electoral Commission (INEC) for its abysmal performance in respect of the conduct of elections in the state, contending that what the electoral umpire did was a mockery and an embarrassment to the democratic world. He queried the wisdom behind the declaration of the PDP governorship candidate, Emeka Ihedioha, as winner in the state when, according to him, there was no clear winner in the election as stipulated in the nation’s constitution. 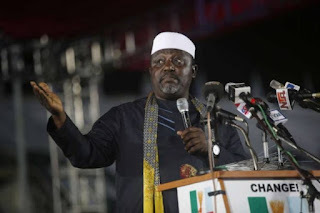 The governor also called for a re-run between the candidate of the Action Alliance (AA), Uche Nwosu, and his PDP counterpart, insisting that there had not been any election in the eyes of the law. “There are efforts to frustrate us and INEC is being used as an instrument to our nascent democracy,” he added. He prophesied that the jubilation and celebration of the PDP over its victory in the state would be short lived, boasting that the Action Alliance (AA) governorship candidate would obtain justice at last.